I know I posted about food making me happy yesterday, but it is a holiday weekend and that means I am cooking a lot. This morning I made my oldest daughter’s favorite… pancakes. Everyone has a favorite kind of pancakes. Mine are light, fluffy and perfect. This is because of the baking powder and the holiest of baking ingredients… buttermilk. I have decided that any and all baked goods are better with buttermilk. Feel free to try my buttermilk pancakes recipe and decide for yourself. Mix your bow of wet ingredients into your bowl of dry ingredients with a spatula. Set aside while you heat a cast iron skillet (will need butter) or non-stick pan (will not need but may want butter) for 5 minutes on med-low heat. Don’t preheat your pan. This 5 minutes will give your batter time to have air bubbles form in the batter and you will want them there for that light and fluffy thing. When you are all preheated throw some butter on the pan and use your 1/4-1/3 cup measuring cup to dump equal portions of batter into your hot pan making sure to leave room to breath. I flip my pancakes as soon as the texture of the outside edge looks a little firm. If you can’t tell looking at the outside edge watch for bubbles to come to the surface towards the center of the pancakes. Pull them off the pan when you think it is done (sorry but you are just going to have to get a feel for that one) and throw them on a baking sheet in a warm oven or on a covered plate. Categories: Good food, Recipes | Tags: baking soda, Breakfast, buttermilk, Buttermilk pancake, buttermilk pancakes recipe, Great leftovers, Happy food | Permalink. 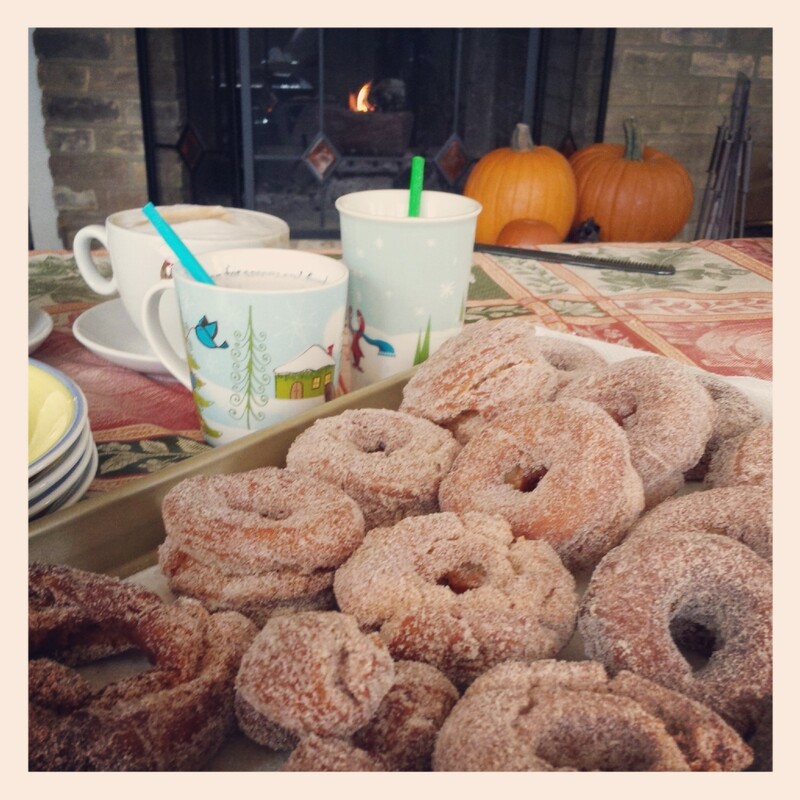 My recipe for a perfect one-week-till-Thanksgiving morning is a chill in the air + a crackling fire + hot lattes and cocoa for the girls + the ultimate hot cider donuts fresh out of the oven and dipped in cinnamon sugar. 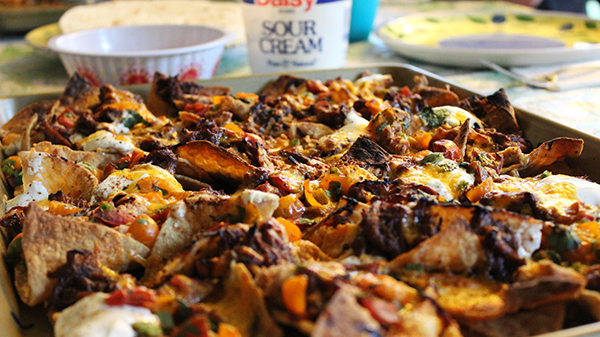 I know you’re drooling. Here’s what you do. Whisk 3.5 cups all-purpose flour, 4 teaspoons baking powder, 1/4 teaspoon baking soda, 3.5 teaspoons ground cinnamon, 1 teaspoon salt and 1/4 teaspoon freshly grated nutmeg. In your mixers bowl beat 2/3 cup granulated sugar and 3 tablespoons vegetable shortening until they look like sand. Add 1 egg plus 1 yolk and 1 cup applesauce. I like using cinnamon applesauce without chunks but it is up to you. after everything is well mixed add half of your flour mixture and combined. Next add 1/4 cup buttermilk and 1 teaspoon vanilla extract. I accidentally spill a little extra vanilla extract in it every time, whoops. Then add the rest of the flour mixture and mix until just barely combined. The dough will be really sticky. Set out a piece of parchment paper and flour it lightly. Coat your hands with flour and then scrape the dough out onto the parchment. Pat down the dough until its in a 7 by 11 inch rectangle or whatever shape as long as it’s about half an inch thick. At this point I always put it on top of a cutting board for a little stability then cover with plastic wrap or more parchment paper and put in the fridge. it needs to sit in the fridge for at least 2 hours but I always do it overnight. The next morning heat vegetable oil in a cast iron pan till it reads 350 degrees. For me this means being patient with medium heat and then turning it down just a bit. You want to be using enough vegetable oil that your donuts will be able to just barely float, not sitting on the bottom. If they are sitting on the bottom they won’t cook evenly. While you’re oil is heating up pull the dough out of the fridge and start cutting your donuts and donut holes. I have a donut cutter but you can always make you with cookie cutters. When your oil is heated place a couple donuts in the pan and occasionally flip until they are a light brown color on both sides. Make sure to crack open the first one and taste test, as this is the only way to know how good the product is. 🙂 As you get the donuts done set them on a baking sheet lined with paper towels in a warm over. When the donuts have all been cooked toss them in cinnamon sugar (2 cups sugar, 2 tablespoons cinnamon and 1 teaspoon pumpkin pie spice.) Please serve warm. They just aren’t the same once they have cooled off. In fact they are so horrible once cold that I should probably eat all the rest of these myself. Categories: Recipes | Tags: Apple cider, cider donuts, Cook, Doughnut | Permalink.